The Orbi RBK20 features parental controls, offers guest Wi-Fi network creation and also works with Amazon Alexa and Google Assistant. Netgear has launched a new Wi-Fi router under its Orbi series, the Orbi RBK20. The new device is said to be capable of providing coverage to homes of up to 4,000 square feet and it features a Tri-band architecture with a dedicated 5GHz wireless connection. The company claims that it can deliver speeds of up to 2.2Gbps. The Orbi RBK20 can cover homes up to 4,000 square feet with strong WiFi signals and the Innovative Tri-band Wi-Fi helps maximize the Internet speeds available in your home. The RBK20 has a unique, industry-first Tri-band architecture with a dedicated 5GHz wireless connection between the router and satellite, which provides both reliable WiFi coverage and maximum internet speed throughout your home with a single network name. The Orbi Systems all deliver industry-leading 802.11ac AC2200 WiFi speeds up to 2.2Gbps*, so you can enjoy seamless WiFi everywhere in your home and around your property, without any dead zones. 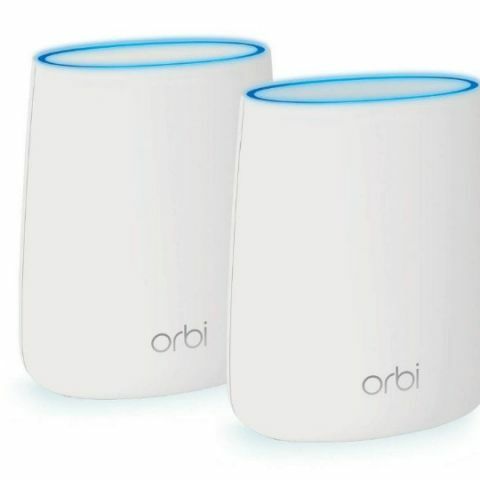 Orbi works with a single WiFi network name and has dedicated Tri-Band WiFi for 4K HD video streaming and gaming. Users can also control Orbi through a variety of voice commands for Amazon Alexa and the Google Assistant. FastLane3 Technology - The dedicated WiFi backhaul creates better 4K HD streaming & gaming, even as you connect more devices.